Discussion in 'Guitars in General' started by digthosetubes, May 6, 2008. Thanks. It's a 51 Nocaster. I got it in January. The amp is a Bogner Duende. I've been meaning to do the photograph and post pics but didn't know how to get an account and all that. Easier than I thought. That inspires me to finish up my similar looking project. It's a one-piece body made of obeche, an African wood that's light, porous like mahogany and kind of a light golden straw color. The neck is a big rounded V Chandler maple. Yours is beautiful. I'm sure the Bogner doesn't hurt, either. The nocaster is the only MIA Fender I have any interest in owning, I've heard really good things about them, even from people who would normally be talking trash about Fender and especially the custom shop because of the prices/value/etc. It's that hard maple neck and those small, precise frets and the underwound vintage pickups. The deepness and roundness of the neck and fretboard. 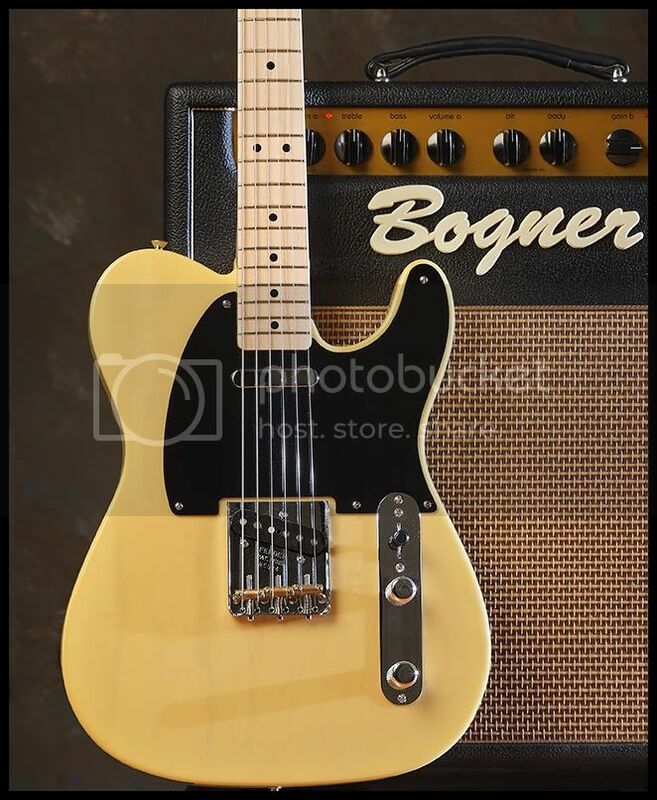 I went to age 53 being sure that Teles were crap and that maple was a third-rate wood for a fretboard. Obviously I didn't know much. I somehow ended up in a store about a year ago playing a relic Nocaster. The feel was intriguing. The sound was sweet. When this NOS became available at a blowout price, I ordered two of them, having played neither. I am not sure I will ever part with either of these instruments. I recently added a Gary Moore Les Paul, finding that to be a very interesting guitar. But about all I ever play are the Nocaster and one of my clasical guitars. A good nylon string guitar -- they mainly come with a dead flat, deep, wide neck -- is a very cool thing to play, especially in the classical style. Then to get to pick up a Nocaster and plug in. I'm telling you. You could do a lot worse. The Nocaster is the best guitar Fender has made in the last 45 years. The worst one I've played was just "Good". A great choice for anyone in search of plank. Maple is where it's at for Teles, IMO. I have a MIJ squire that I absolutely love, it just has a really connected feeling playing on a neck with no separate piece of wood for the fretboard. This neat little store in Falls Church, Va., has some cool fender pieces in and out of there. I played a rosewood tele -- you know -- body and neck all rosewood. Heavy. Even the way that word was meant in the 60s. Wow. I went home and got my checkbook. Brought one of the nocasters with me to see how they played. Believe it or not, the Rosecaster was brighter sounding. Likely the pickups....but we know that a lot goes into the final sound of an instrument. Thank God I got out of that store with just my Nocaster. I prefer it. And I save myself four grand. But I can see how easy it would be to start collecting teles. I can't afford any more gear right now. Not to sound too boring but these nocasters sort of make me realize that it's just the playing of them now that matters. I'm not sure it gets a whole lot better in terms of gear. But I guess some fellows and gals may have even found higher nirvana. I just looked around on ebay, seems like almost all the nocasters for sale are relic'd. That's a shame IMO, I'll relic that thing up the old fashioned way! I don't think the NOS nocasters sold real well. That's why I got mine so cheap from Guitar Center in January. They were overstocked on the NOS. Everybody wanted the Relic versions. It worked out fine with me. I will say that the relics are kind of fun in a way. I would rather buy one already looking broken in than do so myself. I'm one of these OCD types (not that bad) that likes to keep things "new" and shiny. What a pain. Maybe in my next life I'll try to loosen up a bit!? Congratulations on a very cool guitar! I used to feel this exact same way until I owned a few. Now - relic'd is the only way I want any of my Fenders. I don't like them beat to $hit but at the same time when done nicely and tastefully they feel so good!